1485 TRI CLUB CYCLE RIDES will start every Saturday morning from 9.30am. There is also a Tuesday Evening Speed Session Ride from 6.30pm: A 23 mile flat route ( lights required through the winter months ). All rides start from the Markt Bosworth Sports Ground & Club House Wellsborough RD. (B585) opposite the marina. there is parking available at this site. We also have a Beginners ride saturday mornings starting at 9.30am for those who want to come. Rides will be for around an 1hr to 1.1/2hr long some weeks it will be hill work, some weeks sprints and variouse other cycling activities that hopefully will help all of you. rides will be around local lanes and open to all. also we will do a run some weeks after the bike ride, just a run around the sports fields after the bike just so youll get the idea of how it feels to run afer your triathlon bike section of a race. 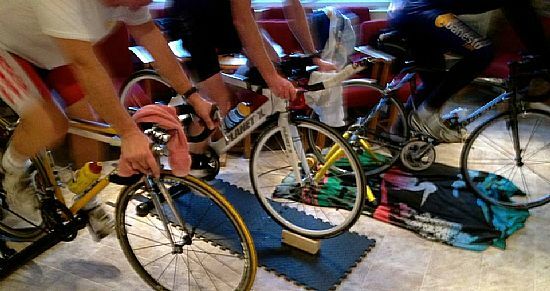 We now have some Cycle Turbo Trainers to use for Speed work sessions and Bike Run Sets. hopefully we will be able to get some cycle racking at the sports ground and do some triathlon transition training too. So feel free to come along and cycle with us on a saturday morning. We Would Welcome Non Members to Join us on our Rides but would Encourage you to Join the Club Membership after 3 Rides with us, its only £30 Per Year. TEAS AND COFFEE AVAILABLE AFTERWARDS TOO.